At the Villas of Kamali’i 20 you get it all – convenient split-level floor plan, gorgeous finishes and incredible mountain views. All this and you’re tucked away in an exclusive gated community. With over 1,800 square feet of space and two master suites, the condo is ideal for two families or two couples traveling together. The main-floor den has a queen sofa sleeper for even more sleeping space. Open and airy with vaulted ceilings and floor-to-ceiling windows, the living room offers a comfy couch, plush armchair and large flat-screen TV. Behind it, gather for meals around the dining table for six. Head out to the lanai off the living room for views of the mountains, waterfalls and surrounding golf courses. Cooking isn’t as much of a chore in the fully-equipped kitchen thanks to an electric BBQ, stainless steel appliances and granite counters. You even get mountain views from the large window over the sink. In the lower level master suite, a king sleigh bed invites you to sleep like a baby and the private lanai provides privacy, peace and an incredible look at the mountains. Its en-suite bath comes with a jetted tub, walk-in shower and his-and-her sinks. The upper level master suite also has a king bed and its en-suite bathroom comes with a large walk-in shower. Air-conditioning in the living room and bedrooms assures you stay comfortable during your stay. Other helpful amenities include washer and dryer in the condo, Wi-Fi, all linens and a starter kit of paper and cleaning products. 1. Two Master Suites: Whether it’s two families or two couples traveling together, the condo’s flexible floor plan suits different groups. The two master suites offer privacy and space with king beds and en-suite baths. Extra guests? The den has additional sleeping space on a queen sleeper sofa. 2. Gorgeous Lanai: Start and end your day on the pretty lanai off the living room, sipping on coffee in the morning and a glass of wine in the evening. Enjoy mountain views all around and when it rains, you can see waterfalls in the distance. 3. On-Site Amenities: Along with being gated, the exclusive condo community has a heated pool, hot tub and BBQ area to hang out with your fellow guests. Get your shopping on at the Princeville shopping center, just 5 minutes down the road. Golfers in your group will love the Makai Golf Course, just a 3-minute walk from the condo. Even if you don’t golf, stop into the clubhouse for a casual breakfast or lunch. For an extra challenge, the Prince Golf Course, designed by Robert Trent Jr. and named the best in the state, is also next door. When you’re ready for sand and sun, head to the world-famous Hanalei Bay beach, just a 15-minute drive away. If you’re looking for an adrenaline high, Anini Beach is also 15 minutes away and well-known for its snorkeling and wind surfing. Just a few minutes from Honalei and right near Princeville- great Mountain Views from the patio. Easy check in and out- great place for families complete with games in the cupboard. This place has parking & is walkable to many places. Hospitality and timeliness with everything was great. Location is perfect. The white buildings with beautiful flowers and plants outside made the grounds look stunning. I loved just walking around the condos because it was so beautiful! I definitely took advantage of the coffee in the condo too! That was such a great touch. Thank you! This place was amazing! We had such a great time on Kauai and this beautiful townhome is the perfect place to stay. Its a short drive to many restaurants and beaches and driving over to the south side of the island to have some adventures is so easy. I highly recommend this place and Kauai! Review for Villas of Kamalii 20 from Airbnb dated 11/11/18: We had a great and relaxing time in Kauai and loved the house and convenient location. Kahala 132 had everything we needed and we loved coming home after a day's adventures. It's a very good size, the kitchen was great and there were even some fins, snorkels and body boards! Everything was very clean, and we appreciated the plentiful towels. The upstairs got a little warm for comfortable sleeping, even in late October. Also, be aware that there is definitely some road noise that you can hear from the master bedroom. The ocean view from the balcony was awesome for breakfast, and we had a bunch of birds and geckos visiting. You can walk to the kid friendly beach in less than 10 minutes. Communication with the hosts was easy and quick. It was very convenient that a rental car was included. We'd love to come back, and we miss Kauai already! Mahalo!!! Everyone was cordial and knowledgeable. The property was beautiful and comfortable. We left early this time for a flight--otherwise I would wish for a later check out time. Nice grounds and pool area. On initial reservation process very helpful. Updates by email made everything go smoothly. Wonderful property....very comfortable with nice amenities. By far the nicest unit in this particular condo complex we have stayed at. Resort style housekeeping was a nice touch. We will be back. This condo is amazing! It is sparkling clean and has a ton of room! If you are looking for a getaway with your family, this is a great place! With that being said, there isnt much to do in the Princeville area. My husband and I found ourselves driving to the west or south part of the island everyday which was approximately an hour drive. However, a rental car was provided which made everything convenient. Be aware of a few things, 1) this group prefers to communicate via e-mail, not the AirBNB chat. 2) they give you a car with the company Alamo. I couldnt figure out why everyone was running me over at the airport to get to the car rental area. I later found out it is because cars are first come, first serve. So if you want a nicer vehicle, you MUST get there early. All in all, awesome place to stay, just not a lot to do in the area. This was a huge beautiful, beautiful condo! Definitely a " Wow" factor when you walk in. The view of the mountains were spectacular. The grounds were very pretty and well maintained. The bathrooms were luxurious (loved the soaps and shampoos). 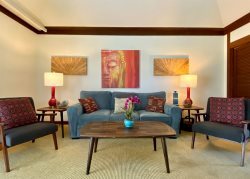 Terrific location, quick drive to Hanalei Bay. The garage was very small, a tight fit for most cars. Overall a lovely place. We had to call them only once as our rental car had died. We needed references for taxi service to the hotel if needed. She happily looked up some for me. We would stay there again without question. I had a wonderful time. The listing is very updated with a nice view of the mountains. I loved the proximity to so many Princeville activities including tennis and golf! I'd definitely go again. This was awesome!!! I didn't want to leave to come home because it was so comfortable. When I return to Princeville, I will stay here again. No parking problems like other places and the area was quiet and relaxing. Maholo! This location could not have been more perfect! 30mins to the Na Pali coast, 10min walk to Queens Bath and Hideaway Beach and so close to food shops. The area is so well kept and beautiful, waking up every morning to the mountain view was a dream. The house was so big, clean and had all the essentials for cooking and beach gear. Could not recommend this place enough - it was spot on! I could not have not have been more pleased with the wonderful service I received from all of the staff I either emailed or talked to on the phone. Whenever I had a question I got a reply almost immediately. Janie was so kind and helpful. We will certainly be returning to this wonderful villa the next time we are able to return to Kauai. There were a couple of light fixtures that needed new lightbulbs, but it was nothing we felt that needed to be addressed while we were there. Thank you so much for making this beautiful villa available for us to enjoy. MANAGER's RESPONSE: What wonderful comments. I am so glad that you enjoyed the Villas. I just knew you would. That beautiful waterfall view in the mornings from the deck is just beautiful, isn't it. COME BACK AND VISIT US AGAIN!!! Response has been very quick whenever we have need to contact the staff. Perfect location for exploring the north shore, especially if you are a golfer. The unit would be superb for two couples; 2 master suites so no one feels slighted.